An inaugural event on the 2010 Formula 1 racing schedule, cars and drivers took to the grid of the Korean Grand Prix amidst a wet track where they are still unschooled on during race conditions. Thanks to wet weather Bridgestones, the Korean Grand Prix readied as a race that almost didn't happen for the 2010 Formula 1 circuit. At the time of the Singapore Grand Prix of late September, buzz surrounded the fact that some of the Korean International Circuit facilities were not ready. Receiving FIA approval on October 11th, (just 11 day before the Formula 1 teams would show up for the grand prix weekend) the Korean Grand Prix was finally set to welcome the country's first F1 event. Three races remaining for the 2010 Formula 1 season, a 31-point separation exists within the World Driver's Championship places 5 drivers in mathematical striking distance of the standing's lead. At the front after 14 grand prix races, Mark Webber has endured the season so far along with pre-season favouritism of teammate Sebastian Vettel by the Red Bull Racing squad and media. With driver Mark Webber leading the 2010 Driver's points and the Red Bull Racing team leading the manufacturer's points championship, the Red Bull-Renaults fly into South Korea revitalized with a textbook-perfect 1-2 finish at the Japanese Grand Prix. Rain fell on the 3.49 mile, 18-turn Korean International Circuit, the 24-car Formula 1 grid led by fastest in qualifying Sebastian Vettel waited on the grid 10 minutes before the safety car showed the field around the race track. A track where grip was already at a complaint of drivers, the decision was made by the FIA to not risk a standing, full-speed start. Led around under a safety car period for the first 3 laps, drivers immediately noticed the race track had no usable grip. Even with full wet weather racing tires, running the circuit was difficult deeper in the field. First-year Formula 1 pilot for HRT Bruno Senna less of grip caused him to pit worried something was wrong with his tires. A red flag was thrown as track conditions were too unsettled. Retaking their grid positions, all 24 cars and drivers were attended to by crew members. After more than 40 minutes of silence, Formula 1 engines once again came alive in Yeongam as the weather settled enough to rerun the Korean Grand Prix. Working lap 4, the Mercedes-Benz SLS AMG safety car resumed to lead Formula 1 drivers to the eventual green flag start on the 18th lap. With the Red Bull-Renaults out front, Sebastian Vettel leads teammate Mark Webber as Alonso's Ferrari stalked the duo. By the end of the first green flag lap, Nico Rosberg driving the Mercedes GP race car had set-up the McLaren-Mercedes of Lewis Hamilton taking 4th place on in the running order. Though the circuit proved race-worthy with standing water and vehicle 'rooster tails' reduced, the slippery track would immediately claim a serious victim which will undoubtedly cause a shockwave through the 2010 World Driver's Championship. One lap following the green flag falling, the Red Bull-Renault of Webber spun when returning to the car's throttle in turn 13 slamming into an inside concrete barrier. Sustaining race-ending damage, Webber's car shot back onto the track ended up in the path of Mercedes GP's Nico Rosberg. The Red Bull-Renault sliding, it clips the Mercedes GP car ending the race for Rosberg in the next turn. Rosberg and Webber left their cars unhurt but the latter driver was left dejected for his 2nd DNF of the season. The long Red Bull Racing car, Vettel held a gap over now second-place Fernando Alonso. Deeper in the grid, the established rain master of Formula 1 Michael Schumacher battled his way into 5th place by lap 27 passing McLaren's Jenson Button for the position. On the same lap, the race of the Lucas di Grassi ended with his car back into a wall. No safety car was needed. As the track continued to show a dry line in some parts, cars began to elect intermediate Bridgestone rubber even though some corners were still tricky. As cars like Jenson Button began to pit around lap 28, a third safety car period created when the Toro Rosso-Ferrari of Sebestian Buemi and Timo Glock's Virgin-Cosworth collided in turn 3 offered a chance for the leaders to take new tires. After pitting, Sebastian Vettel's car would regain the lead but Alonso lost 2nd to Lewis Hamilton by virtue of a slow pit stop by the Ferrari team. ﻿ Though Hamilton gained a position through the pit stop, the McLaren driver would lose the position on the restart shooting wide within a corner. Hamilton's teammate Jenson Button experienced a difficult outing buried in 15th place on lap 37. As only one Red Bull-Renault remained circulating, McLaren's chance to capitalize on manufacturer's points was lost. 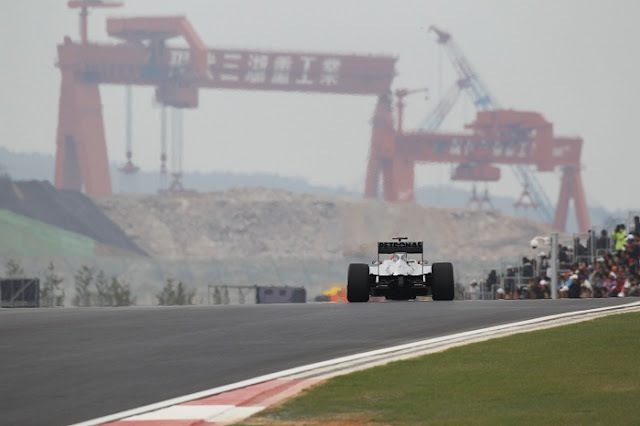 As running vehicles elect for intermediate tires, the South Korean circuit continues to demonstrate low grip track as Button and Sutil were among those venturing off track briefly but returned to the grand prix action. On lap 41 through turn 18, the Renault of Vitaly Petrov was another unfortunate victim of the wet surface paying a race-ending price. Petrov's out of control car veered into the run-off area colliding hard into the softer barrier. Climbing out of his Renault, the Russian Petrov had overcame a grid place penalty to run 11th place at the point of the crash. Already becoming an astonishing race, lap 46 saw the entire complexion of the race changed as the leader suffered a surprise fault. Into turn 1, Vettel's car began to slow as the Ferrari of Fernando Alonso crept up and promptly passed the Red Bull Racing vehicle for the lead. Giving up the 1st place position, the Renault engine immediately explodes on Sebastian Vettel. A crushed German driver emerges from his once-strong Red Bull machine losing 4th victory of 2010 as well as a potential World Driver's points lead out of the Korean Grand Prix. 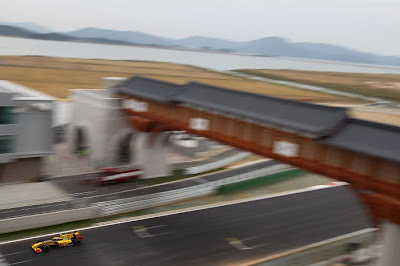 Diving all troubles, Fernando Alonso led the final 9 laps to win the inaugural Korean Grand Prix as darkness of setting daylight consumed the race track at the end. Taking the race winning trophy on top of a well-lit podium, the Spaniard now leads the championship points by 11 points ahead of Red Bull's Mark Webber. Alonso's Ferrari finished well ahead of Lewis Hamilton's McLaren-Mercedes who, himself, was under pressure from the second Ferrari of Felipe Massa but managed to fend off Scuderia Ferrari's 1-2 finish. Lewis Hamilton's second place allowed him to claim 3rd place under Vettel in the Formula 1 Driver's points. Beyond the podium, several drivers enjoyed wonderful runs having endured a wild grand prix. Emerging with a 5 position improvement, Michael Schumacher provided the run of his season with Mercedes GP finishing just outside of the podium positions in 4th. Behind Renault's Robert Kubica, Vitantonio Liuzzi hard-charged up 11 positions from the start to survive the Korean Grand Prix with a 6th place spot for Force India.